Visualizing how information and communication flows. Identifying resources—who is “out there” and could be tapped for involvement. Identifying where people have common interests and priorities to learn from each other or work on strategies together. Identifying who is missing from the network. Some of the data collected as part of a network mapping process can also be used to track the health status of the network from year-to-year. Creating a hand-drawn network on a large piece of paper, using post-it notes, or by having someone develop a map using shapes in Microsoft Word. Participants can either work together to create one map or each create their own and then compare them. The advantage of hand drawing maps is that the process takes very little time and they can be analyzed and discussed by network members immediately. Generating maps with software. This option involves the creation of a web-based survey, sending it to network members in an email, and using software to electronically generate the maps, and then analyzing and discussing the maps. The survey questions must be designed in a certain way in order to use the responses to generate maps. Some of the data collected with this option can also be used to track how the network’s structure is evolving from year-to-year. But remember: It takes human and financial resources to develop and administer the survey, generate the maps, and analyze them. And, it generally takes about 3 months. Identifying the network (or alliance, coalition, policy council, or collaborative) you want to map. Which members (people, organizations) do you want to include? Determining way the maps will be drawn and who will guide the process. Will you do hand mapping or use software? 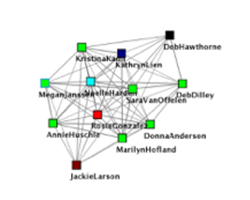 What types of connections do you want to map (who is connected to whom, quality of relationships, who is working on what, etc.)? Analyzing the maps together. What patterns do participants see? Why are the patterns the way they are? Which patterns need to be strengthened and why? Where are there easy opportunities to pursue with would bring more energy and resilience to the network? Developing a set of action steps that specific people will take to enhance the network. Network mapping is beginning to happen across Minnesota. Here are two early examples. Connectivity: Most network leaders report they are not connected to other leaders; about 13% say they have been introduced to someone in another network but have not exchanged information. Collaboration: Very few network leaders (about 3%) have exchanged information, received advice, or worked with another network on a project. Capacity: Most network leaders indicate their network was at a medium level of capacity (meaning that they had diverse and consistent membership, meet regularly, have a variety of ways to engage partners and are guided by a common framework); about 25% indicate a low level of capacity and identified themes for improvement: moving to a network mindset and shared network outcomes and more collaborative work, establishing a shared vision & priorities and having the leadership to implement the work and network growth. Resilience: The network is in an early stage of development. The MN Food Charter Network is well-positioned and two others organizations are serving a hub function of relaying info and fostering collaborative work. The goal is to distribute leadership and connections so it isn’t dependent on a small number of individuals or organizations. Extension staff will be hosting a virtual “lunch and learn” session with interested network leaders to share and discuss the maps, identify any priorities to strengthen their connections, and possible actions to do so. 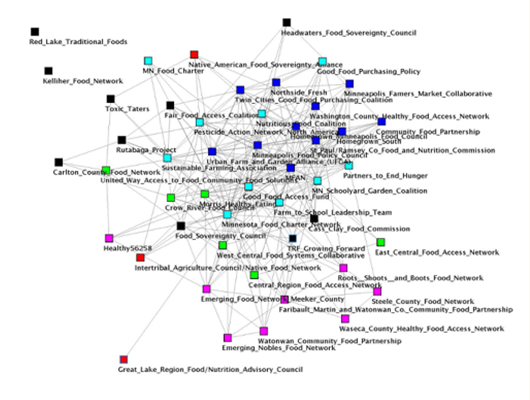 Priorities: One map shows with members of the NW food system have similar priorities and are connected to share information, etc. Strength of connections: Another map shows the strength of connections among people working in the same strategy area (for example, people involved in SNAP-Ed have strong connections while people involved with different community gardens have almost no connections to each other. A virtual “lunch and learn” session is planned so members of the NW food system can explore the maps together, determine aspects of the network that need strengthening, and start to identify tangible actions to do so. Network mapping allows members to see patterns and involves them in identifying priorities and actions to strengthen the health of the network. Mapping can be done using paper and pencil or using a web-based survey and software to create maps. Hand drawing maps is an easy way to begin with a small group. Using a web-based survey and mapping software will take some training. It’s a cyclical process that can be done annually: Determine what to map/questions to ask, creating maps, sharing and discussing patterns, and determining/taking action. 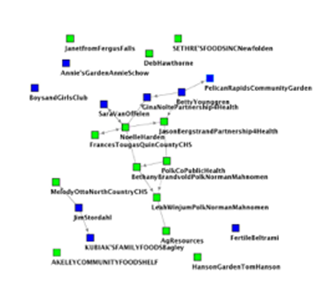 What’s next for Johnstad & Associates: At the 2017 MN Food Access Summit there was interest among half a dozen participants who attended our session on using network maps to influence change. In the coming months we will be piloting mapping processes with a few Minnesota networks and developing resources (survey questions, reflection process, template for sharing information about patterns back) for any network group to use. We’d also like to hear from you if you are interested in being part of a virtual peer learning and support group on this topic in 2018. If interested let me know by December 1 at kristin@kristinjohnstad.com.